← Special price: We are giving you 95 Euro! Gareth Wright (Technical Support Specialist at Audi Australia) is the „CAR ASYST power user of the month: August“. Hello Mr. Wright, congratulations to you and Audi Australia for being named “CAR ASYST – power user of the month”. Audi Australia is one of our key-markets so far, as you already are using CAR ASYST in the communication between the Australian TSC and all your Australian repair shops. Could you please introduce yourself and the Australian Dealer Network to the readers of the CAR ASYST portal? My Name in Gareth Wright, I am a Technical Support Specialist at Audi Australia. I am a qualified Audi Master Technician as well as an Audi High Voltage Expert (level 2b DGUV 200-006). Supporting the Audi Dealer Network with detailed diagnosis support for problematic faults. Supporting the Audi Approved Panel Repairer Network in all body related repairs and tooling query’s. Field monitoring and liaising with TSC Singapore and Audi AG to ensure quality requirement are achieved. 2016 was the 40th Audi Dealership open in Australia! We also implemented the Audi Sport Showroom concept in 17 locations across Australia, 7 Customer Private Lounges were installed, and in 2017 we plan to further extend this, and upgrade to the Virtual Reality Experience! Into 2017, 4 Major Projects are planned including showroom upgrades and a 2 new Service Centres. When did you start to roll out CAR ASYST? We first started using the CAR ASYST APP in May 2016, at that point as a Beta user with the proposal of becoming the Australian distributor for the CAR ASYST VINING 600 OBD adapter. Since late 2016 we have been gradually rolling out the CAR ASYST APP, to-date we have over 36 Audi service centres and Audi approved panel repairers using the APP. In what areas and field of applications do you use CAR ASYST? With the recent introduction of the service light reset the CAR ASYST APP meets all the requirements for the service centre, from the vehicle report at direct reception, service light reset during the service and fault memory erase function if required. CAR ASYST is fast becoming the service tool of choice. 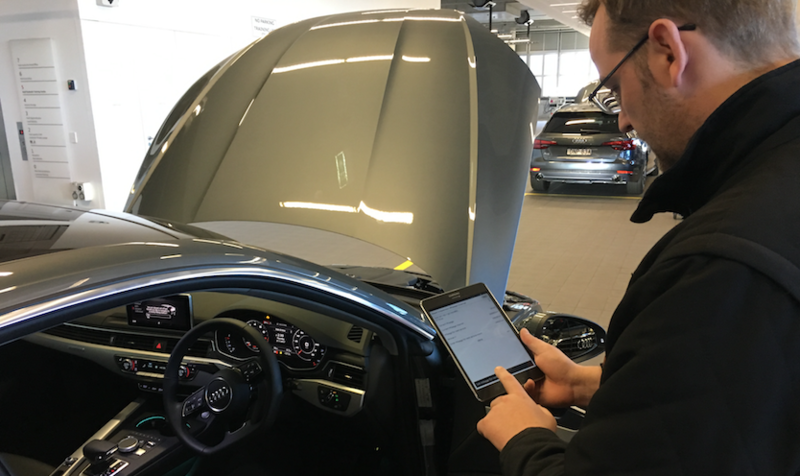 Not only is the CAR ASYST APP lightning quick but it also frees up the Off-board Diagnostic Information System Service for more in-depth diagnosis and online SVM work, therefore the CAR ASYST APP is also assisting increase efficiently in the workshop. We also use the CAR ASYST APP to support in-depth diagnosis where fast visual representation of the MVB’s in cycles are required, using the data recorded along with the CAR ASYST ANALYTICS we are able to provide fast high quality technical support to the dealer network and in turn report any issues back to the TSC and Audi AG. We strongly advise that all Audi vehicles being assessed following collision damage should be checked for DTC’s pre repair. Many safety systems can be affected by minor collision damage, for example the misalignment of a front radar by only 0.8° can cause the ACC system to function incorrectly and display warning lights. A pre repair vehicle report can ensure the vehicle is quoted correctly and any calibrations required are pre booked with the Approved Service Centre. Which functions of CAR ASYST do you use mainly? Personally I mainly use the CAR ASYST APP function – MVB graphical – recording in cycles, in combination with the CAR ASYST ANALYTICS for in-depth technical support. Speed – The CAR ASYST APP is lightning quick and makes basic service function such as service light resets effortless. Simplicity – The CAR ASYST APP is very intuitive to use, and with short online video tutorial the APP can be used without in-depth training. Cost – The CAR ASYST APP is very competitively priced. B8 platform (A4, A5, Q5 < 2016) to be supported with the CAN VAS5054A OBD adaptor, the B8 platform still makes up a large percentage of the carpark in Australia and to have the APP developed for the B8 would be a great benefit. Mr. Wright – we would like to thank you so much for taking the time to speak with us. We wish you all the very best as a “CAR ASYST power user” and are looking forward to the entire month with you!